The team at Valentino's have years of experience in the manufacture of a wide range of standard and bespoke display stands. We manufacture our Custom Made to Specification display stands for many markets. To find out why you should choose us please visit our About us page. Focused on quality manufacture and service, we require a reasonable order quantity to manufacture your custom bespoke display stands. Before this we will send you a quote and produce a Prototype. To receive a quote for your display stand idea, please fill in the form at the contact us page or alternatively call our design team to discuss your bespoke display stand requirements on Tel: 01489 808007 or E-mail to info@valentinosdisplays.com. We look forward to hearing from you soon. 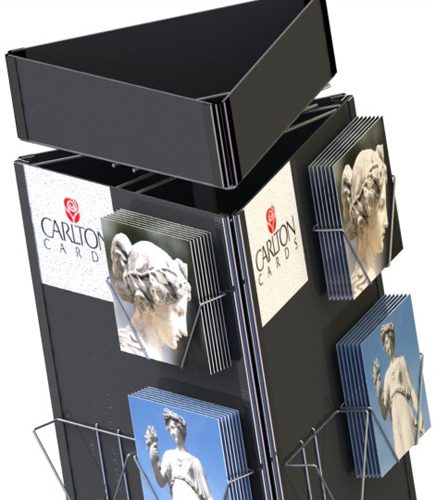 In the meantime please do have a look at our site, because we may already have the display you require, as we manufacture all of our own card display stands. We are able to provide a choice of colours, even on our more standard displays, adding that added interest you are looking for.